Who is the person whose face is painted in the top-right corner? What is his importance? 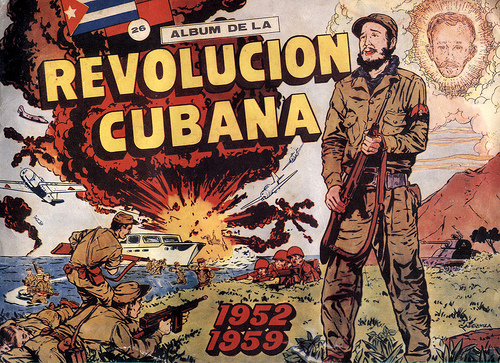 Is the cover (where we see Fidel Castro actively participating against the landing of some soldiers) depicting actual events? Who is the person whose face is painted in the top-right corner? Why does this person is so important that has deserved to be showed on that cover? José Martí, a Cuban national hero. Castro quoted Martí's works both as an inspiration and as justification for the revolution in his 1953 trial and called Martí the "apostle of the revolution". Conversely, the yacht in the background most probably symbolizes the Granma, the yacht that transferred Castro, his brother, Che and 79 others from Mexico to Playa Las Coloradas in 1956. The location of the landing was chosen for symbolic reasons, it's where José Martí landed when he returned to Cuba in 1895. How many that cover, where we see a Fidel Castro actively participating against the landing of some soldiers, is representative of the real scenario the picture want to represent? The picture is symbolic, it's not supposed to depict an actual historical battle. Castro is not shown as actively participating in the landing, he's shown as a "larger than life" figure. If he was participating, it wouldn't be against the landing of the soldiers, but the other way around. Notice the colour of the uniforms and the similarity of the hats, Castro's forces are not the defenders of the beach, they are the assailants. That said, Castro participated in a number of battles, at least in the early stages of the revolution. For example, his arrest happened during the Moncada attack. Why the USSR insisted on ban of the 1943 German film Munchhausen in Nuremberg? What were the FBI's motives for wanting to discredit MLK? How popular was the Soviet Union? Is there a name for the WPA Art Style? Was John S. Mosby the model/motivation/template for John Carter? What is the drawing in this ekphrastic poem?